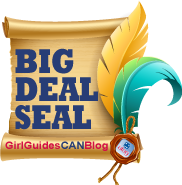 Update: This post was voted a 2011/2012 GirlGuidesCANblog Big Deal Seal winner in the Reader’s Choice category! Bravo blogger Chantal! When I was little, I wasn’t allowed to join Girl Guides, so instead I pretended I was a Girl Guide and planned camping adventures in my backyard for my cousins, and aided injured pigeons. Unfortunately, while in theory these were great ideas, I didn’t have the leadership skills I needed to make these ideas successful so my campouts included putting my little cousin in a pillow case and calling it a sleeping bag, or finding out that pigeons poop A LOT and will come back even if you capture it and drive it over a mile away on the back of your bike. So as an adult I now see the importance of having a good leader for young little minds as things can sometimes go awry without the proper influences. Since the formation of my own self-led troupe, many years have passed. So many years in fact that I have two little girls of my own who I signed up for Sparks the second they were able to join. My eldest daughter had the best first year I could ask for and she learned so much. The leaders organized two beach clean ups, they made shoe boxes to send to our troops in Afghanistan, the kids collected coins to donate to children in Haiti after the earthquake, and this was all in addition to the regular group meetings. I was worried when my daughter was finishing up her second year in Sparks and was searching for a Brownie Unit. There just aren’t enough spaces for the girls wanting to sign up, so it got me thinking. I decided it would be a great idea to become a Guider. For two hours a week I’d be able to be with 16 little girls who genuinely want to be with you, learning new things and doing fun activities with a group of friends. I’m not crafty, I can’t sew, my baking is limited to out of the box (literally it has to be out of a box or good luck to anyone trying to eat it) but I love kids. My reason for signing up to lead is because of the smiles, the friendships, learning and the adventures. So I might not be the ideal Girl Guide leader but I promise to lend a hand. Why did you become a Leader? We’d love to hear about your reasons! This entry was posted in Girls' Guides and tagged brownies, female role models, leaders, leadership, sparks. Bookmark the permalink. Sounds to me like your exactly the ideal leader! Good luck, Chantal! There are TONS of resources on-line that can help you plan and find ideas for crafts and activities. And don’t be afraid to ask for help–women who volunteer to be Guiders are generally helpful, kind women who are willing to help other Guiders. 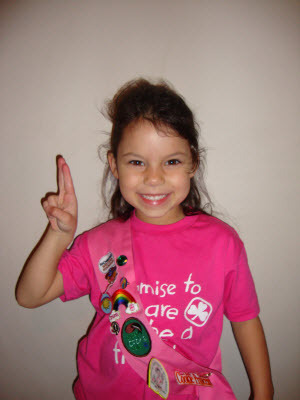 I became a Guider when I signed my daughter up for Brownies. I had been a girl member for 7 years and wanted to help out. “Help out”, I said. When I offered to help, I was a SAHM. Over the summer, I got a full-time job in my field of engineering, and became a full-time Guider as well! That was five years ago. My daughter just earned her Lady Baden Powell Award, and I’m continuing on as a Guide leader, because I love it so much. I was a Brownie and a Guide and very briefly a Sea Ranger (dating myself a bit) in would you believe Edmonton! My father was a Queen Scout and his father was a King Scout. My mother in law was active in Guiding almost to the day she died and my father in law still stored cookies in his garage after Jo was too sick to be active and for years after she died. My now 20+ daughter has already posted that she and I are co-Leaders and that I have been her leader since she was a Brownie (pre-spark days). Every year I say this is my last – that I am too old to sleep on concrete floors and deal with cookies. And a week after we end for the year Sabrina and I are busy planning the next year. My daughter is expecting a baby this year. We already have back up plans for when the baby is due and guess what – I guess this year wasn’t my last year. Did I mention that I am also working with a Pathfinder unit??? There are so many reasons for joining. I did not share the joys of guiding as a girl but by daughter asked to join Brownies and it started. When she was ready for Guides we heard of a unit on the other side of the city where the Guiders ran an amazing program. She was accepted – what Guider can say no? At registration night they were asking for parent helpers because one of the Guiders was ill so, of course, I signed up for a couple of nights…well…as so often happens not many of the parents volunteered so I happily ended up volunteering for the three years my daughter was in Guides. When she advanced I was asked…”will you register now?”….so I did and have been happily sharing my time with the girls for 20 years.